I’ve been in Atlanta since Sunday, visiting family and attending a medical meeting with my husband. This morning I’m taking him to the airport to head off to D.C. for another meeting while I stay and visit with my childhood best friend, Jan, who was maid of honor in our wedding 45 years ago. It’s a rainy day in Georgia, so I’m heading to Phipps Plaza for some indoor shopping first. All that to say I’m not writing, but I’m giving a shout out to Atlanta author, my friend Jessica Handler, Author of The Invisible Sisters (a terrific memoir) and Braving the Fire: A Guide to Writing About Grief. A copy of Atlanta magazine was in our hotel room, and I loved Jessica’s article, “You In the Beige!” It’s Jessica’s humorous and poignant account of the photo shoot she was invited to participate in for Vanity Fair about five years ago. 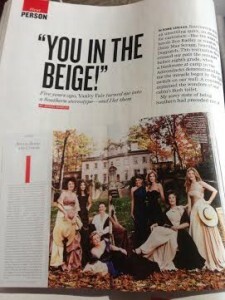 They gathered a group of Georgia authors and dressed them in Southern frocks and posed them in front of a mansion. “Vanity Fair Turned Me Into a Southern Stereotype—and I Let Them. 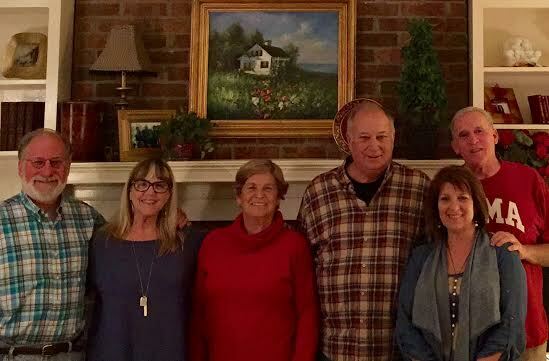 Bill, me, Brenda and Tod Cushman, Cathy Cushman Alexander and Kirk Alexander – great time with hubby’s siblings in Atlanta!